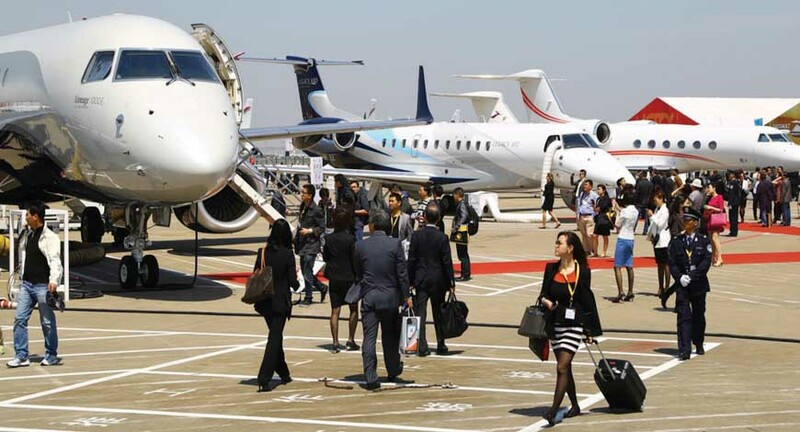 Despite a slowdown in economic growth, aviation giants at the Singapore Airshow still view China as being the most promising market in the near future and beyond. Boeing and Airbus have both published their expectations for the next 20 years in the aviation industry, and see strong growth in Asia Pacific market, with China, as they have stated, clearly having the most growth potential of all the markets. According to Boeing, Chinese airlines will require about 6,330 new planes worth around $950 billion over the next two decades, which accounts for about 17 percent of the global total. Meanwhile, Airbus China said that since 2010, the number of new aircraft deliveries have remained above 100 every year, with a total of 158 aircraft delivered last year, representing about one quarter of the total number in the Asia Pacific region. Over the next 20 years, Airbus expects China to require about 5,400 new planes, comprising 40 percent of deliveries for the whole Asia Pacific region. China’s annual economic growth has dropped to its lowest level since 1990 at 6.9 percent last year, and emerging markets in the region have also encountered major fluctuations in stock markets, therefore, concerns have been voiced about whether the slowdown of regional economic growth, especially the slowdown of China, would pose risks to the aviation market during the airshow. John Leahy, Chief Operating Officer of Customers of Airbus said that he expects to see double digit growth in terms of aviation traffic in the Chinese market every year, while Fabrice Bregier, Airbus President and CEO stressed the company’s confidence in the still burgeoning Chinese market. “We don’t see the slowdown, our competitors don’t see it, our customers don’t see it, we have never been so happy,” he said. Despite cooling GDP growth, total consumption in China has been climbing, which contributed 66.4 percent to economic growth last year and becoming a new growth driver for the world’s second largest economy, while tourism has also notably expanded. According to statistics from the Civil Aviation Administration of China, it is estimated that passengers made a total of 440 million trips in 2015, up 11.4 percent on year. International routes also registered an explosion, increasing to 660 international routes. It’s the strong growth that keeps new orders flooding into the books of these aviation giants. On the second day of the Singapore Airshow, China’s Okay Airways signed a contract for 12 Boeing 737 jets, making it the first Chinese airline to order the 737 MAX 9 series. Multinational conglomerate Honeywell have been present in the Chinese market for decades. Its Asia Pacific Business Development Director Paul Nef told Xinhua that China, as a huge market, still has great potential in the aviation industry. Nef has been in China since 1981, who now speaks fluent Chinese. He said that Honeywell has been cooperating with Chinese companies including the Commercial Aircraft Corporation of China Ltd. as well as the Aviation Industry Corporation of China on many programs and he has also witnessed the dramatic change in the Chinese aviation industry. And with the dynamic evolution of the aviation market, Honeywell has also adjusted its focus from facilities manufacturing to air traffic management and maintenance, overhaul and repair. With the number of airlines growing, some companies are looking for international companies such as Honeywell to outsource their operations and maintenance services to. That, from Nef’s point of view, would create a new growth area in the Chinese aviation market. Another area with growth potential is the low-cost carrier sector, Nef said. Low cost carriers now account for an average of 30 percent of market share in North America, Europe as well as the whole of the Asia Pacific region, yet currently only accounts for 8 percent of the market share in China. “Low cost carriers can break the traditional idea of the aviation industry and create a new model of affordable travel. Especially for short-haul flights, low cost carriers definitely fit market demand here,” he said.